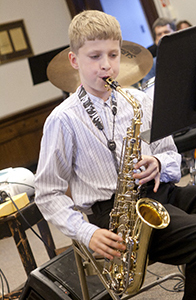 Our private saxophone and clarinet lessons are offered to students age 10 and older. After a consultation with one of our instructors some students have begun at ages 8-9. One determining factor is whether the student has developed the lung capacity and strength to handle these instruments. Our saxophone and clarinet instructors are proficient on both instruments so a student can start with clarinet lessons if they wish and switch to saxophone lessons without having to change instructors. 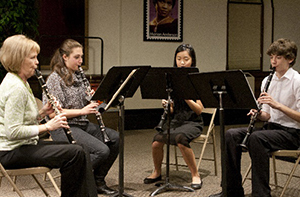 Our saxophone and clarinet instructors actively perform in all types of bands and ensembles and as soloists. Saxophone, clarinet and flute lessons are offered in 30 minute, 45 minute and 1 hour lengths. Many of our adult students have fulfilled their life-long dream to take up one of these instruments. Students are introduced to a wide range of musical styles and also given the opportunity to join either our band ensemble or flute choir.